United Coatings™ EnergyCote™ Roof Coating is a brilliant white, water-based, low-VOC, highly reflective, elastomeric coating that cures to form a seamless rubber membrane. It has been specifically designed to treat seams, laps, flashings, and other edges and details in reflective cap sheet products such as the EnergyCap™ roofing membrane. It is flexible and, due to unique emulsion chemistry, resists unsightly bleed-through over asphalt substrates better than other coating systems. See applicable warranties and guarantees for complete coverage and restrictions. Shelf life 12 months if unopened containers stored between 50°F and 80°F. Protect from freezing. United Coatings™ EnergyCote™ Roof Coating is designed to add reflectivity and protect areas of asphalt bleed-out on white reflective asphaltic roll roofing applications to give a uniform, brilliant white finish across the whole roof area. Matching granules may be broadcast into the asphalt bleed-out at seams prior to coating to enhance the finished appearance of the membrane. Weight per Gallon: 12.0 ± 0.5 lbs. SUBSTRATE PREPARATION: Roof must have positive drainage with no moisture trapped in the roof membrane. For non-metal roofs, GAF requires a moisture scan be performed by an independent source prior to issuance of a GAF guarantee. Roof substrate must be clean, completely dry, and free from any foreign matter. Pressure wash to remove all dust and debris, and allow to dry. Examine substrate to receive new roofing and conduct test patches to verify adhesion of coating prior to start of work. Check for any damaged roof membranes, including all flashings and penetrations, and repair as needed. MIXING: EnergyCote™ Roof Coating is a ready-to-use material; however, some settling of material may have occurred during shipment and storage. Mix prior to use with a ¾ horsepower or larger mixer with a blade capable of uniformly mixing the entire container. For 5-gallon (19 liter) pails, use 3” (76 mm) minimum diameter mixing blades. For 55-gallon (208 liter) drums, use 6” (151 mm) minimum diameter mixing blades. APPLICATION: Apply when temperatures are above 45°F (5.5°C). Apply product with a roller, roofing brush, or sprayer, covering the surface at an even rate. For spray application, use an airless spray pump with a minimum 2 gallons-per-minute (7.6 L/min) output and a minimum 3,000 psi (20,685 kPa) pressure capability. Use a reversible, self-cleaning tip with an orifice size of .033” (.84 mm). Allow each coat to fully dry before applying next coat. Each coat shall be applied in a direction perpendicular to the previous coat. Apply at a rate of 1.0 gal/100 ft² (3.8 liter/9.3 m²) per coat. Total gallons (liters) per square depends on roof surface and specifications. Granular and coarse surfaces will require more coating than smooth surfaces to achieve desired dry mil thickness. 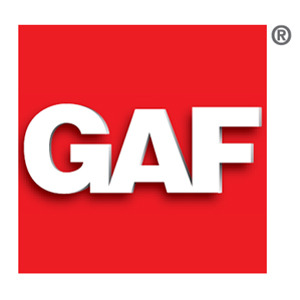 For Application Questions: Contact GAF Technical Services at 1-800-766-3411 or visit gaf.com. Note: Repair leaks promptly to avoid adverse effects, including mold growth. Store in well-ventilated area at 50°F to 80°F. Protect from freezing. For specific information regarding safe handling of this material please refer to OSHA guidelines and product Safety Data Sheet (SDS).